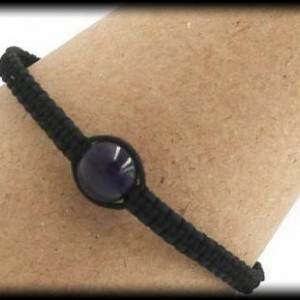 Promote your intuition and bring new beginnings into your life with this Moonstone bracelet. Moonstone, known as the "Stone of New Beginnings", also balances male-female energies, balances hormones, and provides passive feminine energy. 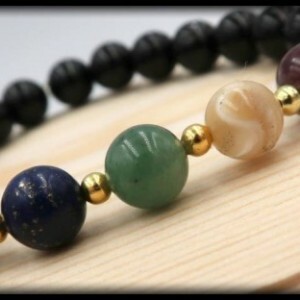 Incorporated with the 7 chakra stones that are known to attune your spiritual purpose, promote positive attitude, stimulate enlightenment, understanding, prosperity, attract love; as it also harmonizes the mind, body, and spirit. This lovely item contains 8mm Stones of Moonstone, Clear Quartz, Black Obsidian, Lapis Lazuli, Green Aventurine, Mother of Pearl, Pink Tourmaline, and Hematite. SIZING INFORMATION Please measure your wrist with a measuring tape to ensure the most accurate measurement. If you do not have a measuring tape, you can also use a string by wrapping it around your wrist and then cutting the piece of string. After you have your cut string, place it alongside a ruler and write down your measurement. To ensure a perfect fit, please had 0.5 inch to your wrist measurement, if you want a little room please add .75 inches to your wrist measurement.